As 2018 ends, 2019 will bring with it a new year of trade shows and a new year to promote your business. Whether promoting yourself at industry events, public sponsorship opportunities, or community fairs, putting your best foot forward means creating an eye-catching display to draw attention to your business. Taking advantage of the new year is a great way to roll out a new show display. According to Forbes, “One of the most important things you can do before a trade show is to plan well ahead of the scheduled time. It is never too early to start.” We couldn’t agree more. Read through these fast five tips to make sure you hit 2019 running! Recently, the Huffington Post reported that “studies show that your first impression has a high correlation with the actual long-term status of your relationship.” They followed up by noting that it only takes a person one-fifth of a second to form an opinion on a website and that 94 percent of that opinion is design related. The data is pretty telling – it’s crucial to create a display that speaks to your product or service. Entrepreneur notes that having a large footprint at a show is nice, but not necessary. At Ocreative, we firmly believe in quality over quantity, too, and recommend that you pick flexible display mediums with quality messaging and design rather than creating new display materials for each trade show. Consider choosing flexible mediums such as a display monitor or flat-screen TVs with looping video highlighting your key message. Work with a design team to create banners or booth tents that utilize space efficiently and convey your message at a glance. Forbes points out that “fun giveaways equal more traffic” and it’s true. If we’ve learned anything over the past 15 years, attending marketing fairs and preparing our clients for their shows, it’s that people love.free.stuff. 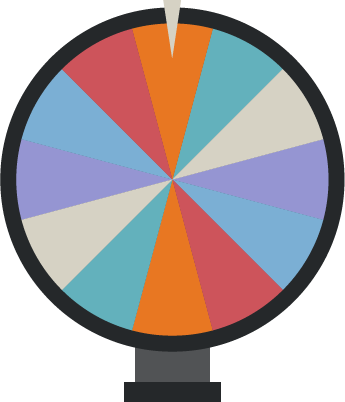 Consider using a prize wheel, giving away food, or holding a drawing to bring in foot traffic. Here’s the thing, there’s no such thing as a free meal – make sure your booth visitors are taking some sort of action to get their prize. Whether it’s providing contact information, discussing a key topic, or taking part in a survey – find a way to engage! People visiting trade shows and fairs generally get a lot of handouts. Putting your sales pitch on a regular old 8 by 11.5 is going to land you and your ideas in the recycling bin. Consider creating unique formats for your handouts – a specially designed folder, heavily glossed and heavy-weight paper, unique cuts and sizes, change up the media you put your marketing materials on – just be sure to get creative. Use a design team to create an interesting visual display of printed information. We cannot stress this enough! Go full color, add an infographic, and brand your materials! While you are evaluating your print materials, it might be a good time to update your business cards. To learn more about the importance of making your business cards stand out, check out our article: The Importance of Business Cards in Today’s Digital World. An easy way to extend your reach at a conference is to hand out promotional items. According to James Gibson, contributing author at Huffington Post “Promotional giveaways that are easily visible are a way to extend your booth’s reach… These are great because the more people you get to wear them, the more others will want one. 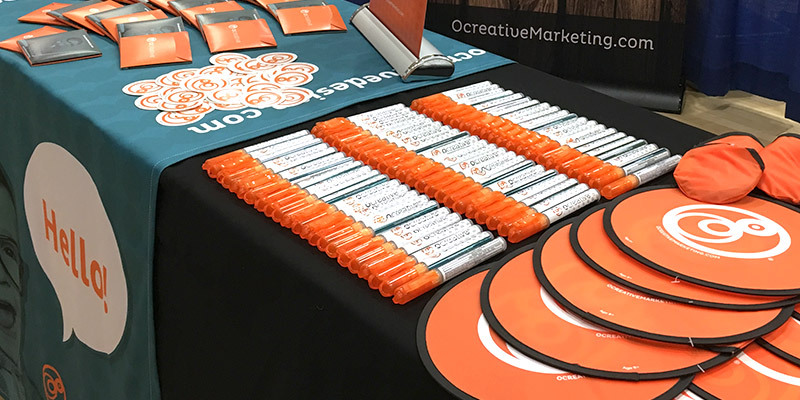 It’s also a great conversation starter for attendees- and your brand and booth are inserted into that conversation.” (Huffington Post) At Ocreative, we’ve branded everything from frisbees to harmonicas. For more information on choosing the right promotional items, check out our blog: Promotional Items: Brand Awareness That Lasts. Creating a unique display, handing out the best print materials and offering prizes and SWAG is only half the battle. Do not expect the people that visited your booth to follow up. Use the data you collected to reach out. The Huffington Posts notes that “people have many interactions at trade shows… Don’t be afraid of reaching out too quickly. Typically wait one day after the show to follow up with potential prospects. 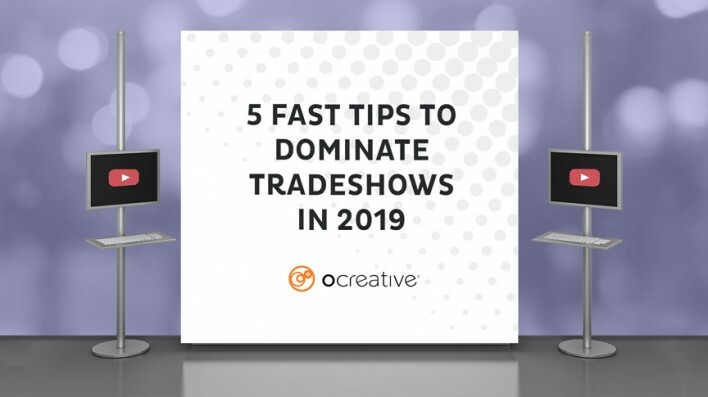 Waiting too long will dilute the connection.” One way to get the jump on next year’s trade shows would be creating a list of the shows you will attend and then creating automated email drip campaigns to send to the contacts you make. Write down personal details about your new connections during the show and update your drip campaigns as soon as possible. If you aren’t sure how to set up an email marketing campaign, check out our three-part series on email marketing! Preparing for a trade show requires organization, creativity, and hard work, but the payoff is insurmountable. A little forethought and planning can create big leads and boost revenue all year. As you evaluate your 2019 budget, research the potential sales and brand awareness that trade shows can offer your business and consider adding it to your budget. Ocreative has spent 15 years creating eye-catching, stand out materials for both our clients and our own displays. Check out our portfolio to see some of our work!